HomeA Reflection from HIS 2018: What is the main driver for C. difficile infection? Antibiotics or C. difficile acquisition? Mark made his case first, putting together strong arguments that antibiotic exposure is the strongest risk factor for the development of CDI, and that removing the selective pressure of antibiotics reduces HA-CDI. I presented a visual framework of drivers for CDI (see Figure 1). This was to highlight that antibiotics form part of a complex network of CDI drivers. Which is most important? We don’t really know, but I argued that acquisition trumps antibiotic exposure! The acquisition of difficile colonisation is rare in the community (<0.5%), weirdly common in neonates (up to 50%), and more common in hospitals (around 5% on admission) BUT it’s not normal, it’s not ok, and it’s not an inevitable consequence of hospitalisation! Gut dysbiosis, which is a necessary part of difficile infection pathogensis, is a complex phenomenon; we are only really now scratching the surface of the causes. Antibiotic exposure is an important cause of gut dysbiosis that can result in C. difficile infection, but it’s not the only cause (e.g. PPIs). What has caused the ‘English MRSA and difficle miracle’ reductions? What is driving the increases in E. coli and MSSA BSI? The answer: who knows: there are multiple interventions drivers. There’s a risk of spurious correlation and riding the epi curve to glory. There is a strong case that fluoroquinolone restriction and not IPC measures have cause the ‘ difficile miracle’ in Oxfordshire from a Lancet ID study. However, the argument depends on the assumption that antibiotic resistant and susceptible bacteria respond similarly to IPC measures, whereas modelling (by Marc Bonten’s group) suggests that they do not! This differential response of antibiotic resistant and susceptible bacteria to hospital based IPC measures due to differences in transmission dynamics could explain the trends in staphylococcal BSI in England: MRSA has waned, whereas MSSA has waxed. Patient to patient transmission of difficle in hospitals has NOT been ruled out by genomic studies that find surprisingly rare links between symptomatic cases: not all sources included (e.g. environment and asymptomatic carriers) along sub-optimal lab methods means that this study only tells half the story. Environmental contamination is a hugely important driver for CDI: spores are shed everywhere, survive for ages, and you’re 3x more likely to acquire CDI if the patient in your room before you had CDI. There’s compelling evidence that hand hygiene is another hugely important driver for CDI: increasing soap and water use correlated with reduced CDI, whereas increasing alcohol gel use (not effective against spores) correlated with increased CDI. There’s emerging evidence that admission screening and isolation of asymptomatic difficile carriers has a profound impact on the rate of CDI. Whilst it may not make sense to implement this right now, this illustrates the importance of C. difficile acquisition. In summary: antibiotic exposure is neither necessary nor sufficient as a cause of CDI, whereas the acquisition of C. difficile colonisation is necessary and may even be sufficient in some cases. Put another way, you can suffer difficile infection without exposure to antibiotics, but you can’t suffer C. difficile infection without exposure to C. difficile! You can download the slides from the talk here. Figure 1: Drivers of CDI; drivers of C. difficile acquisition in red, gut dysbiosis in blue, and others in green. And the result? A poll of the audience before hearing the arguments found that one third votes against the motion that antibiotics are the most important factor (Figure 2). 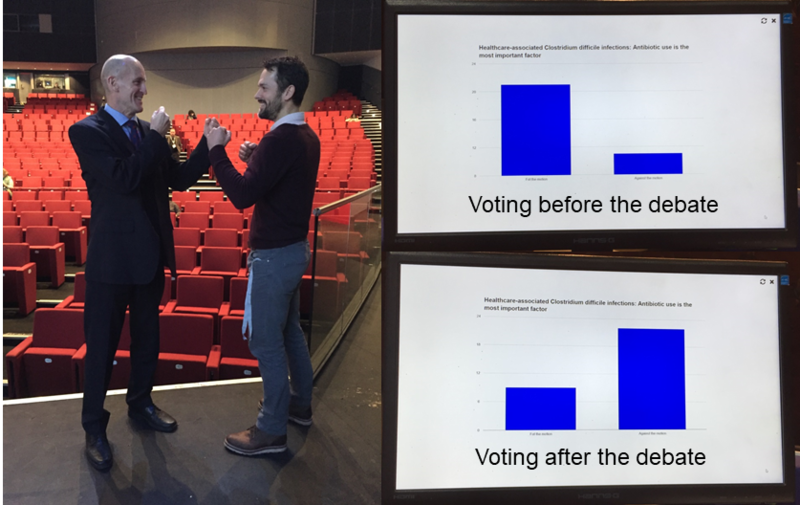 After the debate, the audience had switched allegiance and two third voted against the motion! It was fun to be a part of the debate, and I hope that it was useful in highlighting some of the issues and uncertainties around C. difficile infection and transmission dynamics in hospitals. Figure 2: Facing off before the debate, and the all-important results. I enjoyed the debate and the use of the margarine versus divorce rate correlation in Maine. You won my vote! Ha thanks! I enjoyed it too! !